Alexander Fleming, a Professor of Bacteriology at St. Mary’s Hospital in London, discovered the first antibiotic in 1928. He’d been experimenting with colonies of Staphylococcus bacteria growing in Petri dishes. And Fleming noticed that one dish had a spot of mold with a clear ring around it. This ring was identified as a secretion from the mold that prevented further bacterial growth. It turned out to be penicillin. Fleming and his colleagues worked to isolate penicillin, discovering its ability to attack other bacteria, like streptococcus, meningococcus, and diphtheria bacillus. In later years, researchers developed new antibiotics that were effective in killing different classes of bacteria. Together, antibiotics have saved millions of lives worldwide — overpowering such potentially lethal diseases as meningitis, tuberculosis, and cholera. When used appropriately, antibiotics are a blessing and a welcome arrow in humanity’s medical quiver. But the reality is that they’re vastly overprescribed. The Centers for Disease Control and Prevention estimates that as many as four out of five Americans are prescribed antibiotics in any given year — and many of these prescriptions are unnecessary. Antibiotics are often dispensed like Halloween candy. Feeling under the weather? Here’s your broad-spectrum antibiotic prescription! And this lax approach doesn’t come without consequences. Antibiotics don’t target only the harmful bacteria in your body. They’re destructive to all microbes. And they leave your body’s natural microbiome imbalanced and damaged. This ecosystem won’t always properly restore, either, unless you make conscious efforts to do so. Odds are, if your microbiome is currently out of balance, past antibiotic use has significantly contributed to your condition. It’s also likely that the health professionals who prescribe them to you don’t discuss how to counteract the collateral destruction of good bacteria in your body. A couple of years ago, I was considering taking antibiotics to fight a strep infection. I asked my doctor if he could recommend any protocol for repopulating my body with healthy bacteria. It’s pretty crazy, if you think about it, that our medical system is so good at destroying a bacterial ecosystem but so ineffective at rebuilding it. Antibiotics don’t only damage good bacteria. Their overuse encourages the widespread development of “superbugs,” or bacteria that display antibiotic resistance. Bacteria, you see, are very much like accountants. No matter how much you change the tax laws, there will always be wily accountants who will find a way around them to escape taxes. Similarly, when you increase the dose of antibiotics or engineer new ones, some bacteria will find a way to mutate and resist them. As a consequence of antibiotic overuse, we’ve had to start turning to “last line” antibiotics. Typically, these medications are only used as a last resort because the usual medications no longer work. These drugs are meant to be used sparingly in human medicine to limit bacterial exposure to them, in the hope of preventing the development of antibiotic resistance. Unfortunately, because antibiotic resistance has increased, the prescription of last resort antibiotics has also increased. Antibiotic resistance is leading to more and more deaths that once were preventable. That doesn’t sound like the kind of progress we’ve been led to expect from the field of medicine. In the United States, at least two million people contract an antibiotic-resistant infection each year. And 23,000 people will die from them. Worldwide, antibiotic resistance is estimated to cause more than 700,000 deaths per year. And these numbers are rising. Superbugs now threaten to make many common infections, such as urinary tract infections and pneumonia, once again lethal. Many public health authorities fear that we could be on the verge of entering into a “post-antibiotic world” that threatens to kill millions of people annually by 2050. Antibiotic resistance already costs over $55 billion in medical treatment and hospitalizations. And this number is expected to rise dramatically in the coming decades. It shouldn’t come as a surprise, then, that the World Health Organization has declared antibiotic resistance to be one of our greatest global threats to health, security, and development. But is the medical overuse of antibiotics really the primary cause of the rise of the phenomenon of antibiotic resistance? The creation of factory farms, also known as Concentrated Animal Feeding Operations (CAFOs), came about in the last century as a way to keep up with the enormous demand for animal products. Modern farms look far different from farms of the past. The images that leap to my mind when many of us think of a farm — the iconic red barn or a green pasture full of animals happily grazing in the sun — no longer represent how most farm animals spend their lives. To say that animals in CAFOs endure close quarters and overpopulation would be an understatement. The average chicken raised for meat has less than one square foot of space per bird. Modern broiler operations grow their birds so obese that they often become unable to walk. These birds spend their lives sitting in feces. Animals regularly get sick, injured, and even die as a result of these miserable conditions. How do modern CAFOs cope with the threat of disease wiping out their livestock? Antibiotics to the rescue! They routinely administer antibiotics not just to livestock who are sick, but rather to every single animal living in these filthy and brutally inhumane conditions. In addition to helping keep animals alive in an unsanitary environment, they serve another purpose, too. 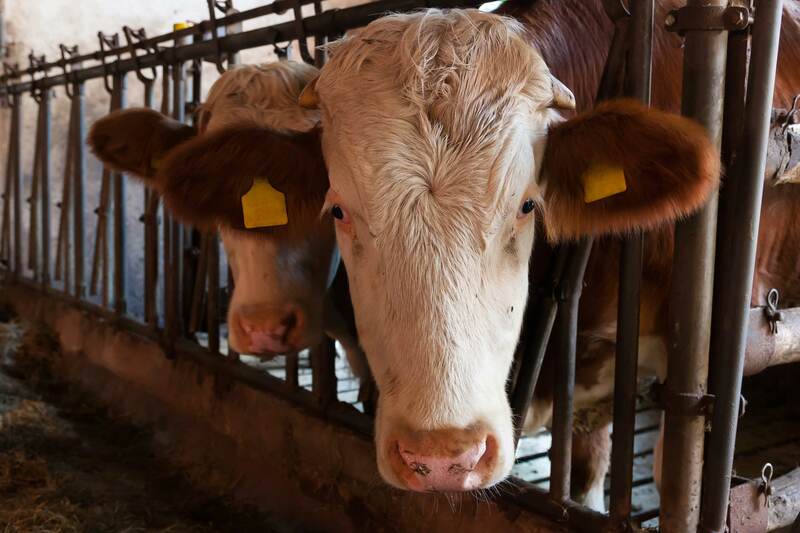 It turns out that antibiotics make animals gain weight faster — which increases producer profits. How Do Bacteria Become Antibiotic Resistant in CAFOs? When bacteria has continual exposure to low doses of an antibiotic, any of the microbes that are resistant to the drug will survive and reproduce. The rest die off, resulting in a new bacteria population resistant to the antibiotic. Modern factory farms provide continuous low doses of antibiotics to billions of livestock. This creates the perfect conditions for breeding antibiotic-resistant bacteria. If for some diabolical reason, someone wants to create conditions that breed antibiotic-resistant bacteria, they would be hard pressed to do better than the conditions prevalent in industrial meat production today. Already, the breeding of antibiotic-resistant bacteria in modern meat production is hurting human health in many ways. Did you ever get sick after eating at a restaurant? It’s an experience that’s not easy to forget. Hours after eating a delicious meal you’re regretting ever leaving the house that day. Foodborne illnesses — such as salmonella, listeria, and E.coli — affect one in six Americans every year. That’s more than 55 million people annually. About 128,000 of them will end up in the hospital for their symptoms. And 3,000 of these people end up dying. Two of the most common foodborne pathogens are salmonella and campylobacter. They causearound 410,000 antibiotic-resistant infections in the United States each year. Where do these bacteria come from? The truth is most pathogens that cause food poisoning originate with the intensive, confinement-based livestock production methods used in factory farming. The truth is most pathogens that cause food poisoning originate with the intensive, confinement-based livestock production methods used in factory farming. The U.S. federal government tests supermarket meats to track trends in bacteria and resistance. Recent findings show that 87% of bacteria that FDA testing found on ground turkey was resistant to tetracyclines. Tetracyclines is the most widely used antibiotic in farm animals. And it is a critical medicine to treat serious bacterial infections in humans. Additionally, one in five strains of salmonella in chicken meat were resistant to amoxicillin. Amoxicillin is the second most frequently used antibiotic on farms. It’s also the number one medication doctors prescribe to children. E.coli has been found to contaminate 80% of raw chicken samples tested. Beef is the most common source of E. coli exposure for humans, causing more than 55% of outbreaks. It’s also a major part of the salmonella risk. In 2011, Environmental Working Group conducted its own study that found superbugs in 81% of the ground turkey and 55% of the ground beef in U.S. supermarkets. What About Food Recalls from Vegetables? But, wait, you say! What about the E. coli that have been found in plant foods, like romaine lettuce or tomatoes? Aren’t vegetables as risky as animal foods? It’s a reasonable question to ask, given the media coverage of E. coli outbreaks. But the truth is, E. coli live in the intestines of animals. Last I checked, romaine lettuce and tomatoes don’t have intestines. The only to link any vegetable to E. coli is by the contamination of animal feces. Usually, this contamination happens because there’s a factory farm upstream (or up-manure) from a vegetable farm. It’s remarkable how often media coverage of E. coli scares does not convey these plain facts. If you want to protect yourself and your loved ones from the majority of foodborne pathogens, the quickest and most effective step you can take is to adopt a plant-based diet. Pathogens, like E.coli and Salmonella, are abundant in animal waste. They can run downhill during a rainstorm or seep into underground aquifers. And ultimately, they get into nearby water systems that spread the pathogens elsewhere. These hardy pathogens can spread not only to raw meat products, but also to produce through water or soil contamination. And they can spread to cooking surfaces where you or someone else prepares food. When you consume this contaminated food, that’s when you may get sick. 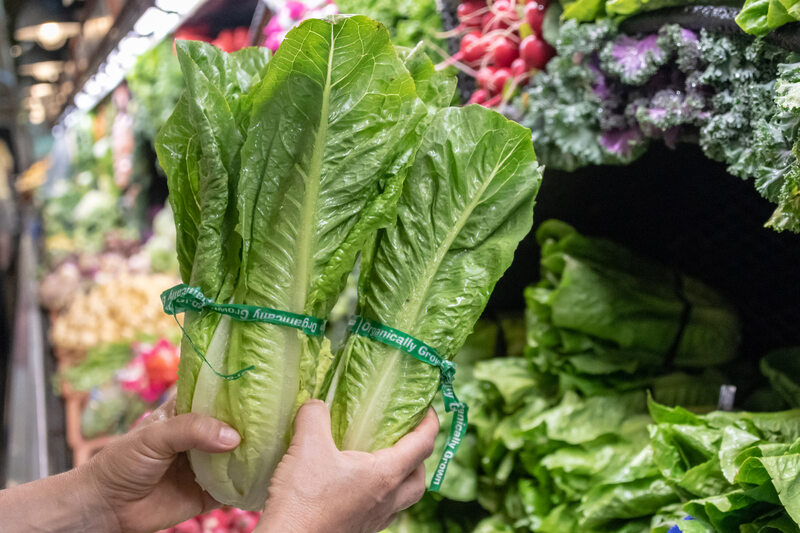 The largest multi-state E.coli outbreak in over a decade, related to romaine lettuce, occurred in the spring of 2018. It ended up affecting people in 36 states, resulting in 210 illnesses, 96 hospitalizations, and five deaths. What caused it? All evidence points to a large industrial cattle farm near the affected romaine crop in Arizona. The November 2018 romaine recall doesn’t appear to have any relation to the one earlier in the year. However, the strain of E.coli has the same DNA fingerprint as a recall in late 2017 that spread to Canada and 25 states. The odds are, the origin is a CAFO somewhere. 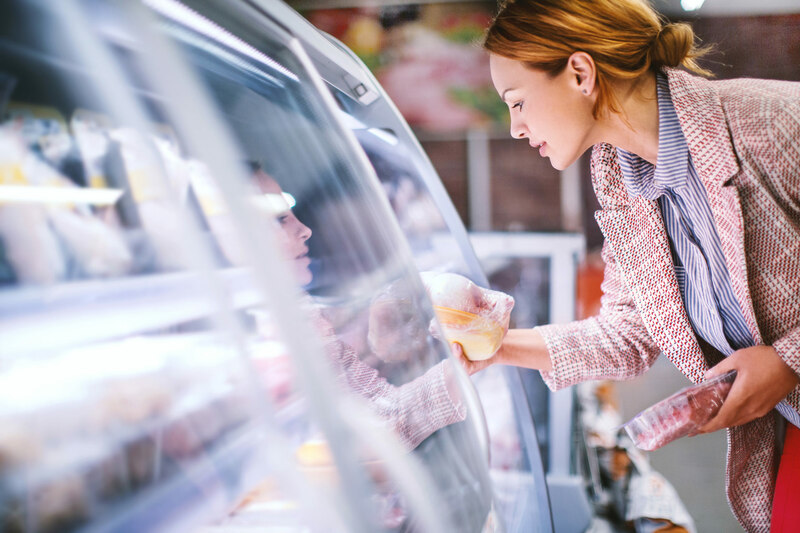 Avoiding the top contributors (meat, fish, and dairy products) significantly reduces your risk of exposure to potentially life-threatening foodborne illnesses. And what about produce? Washing leafy greens thoroughly before eating them is a good habit to put in place. And cooking helps, too. It’s true that antibiotics are overprescribed to people, and that is a problem. But antibiotic use and abuse is even more egregious in animal agriculture. According to a study in the Proceedings of the National Academy of Sciences in 2015, the world uses about 63,000 tons of antibiotics each year to raise cows, chickens, and pigs. That’s roughly twice the amount of all antibiotics that doctors prescribe to humans globally. In fact, 80% of the antibiotics used in the United States are not given to sick humans, but to animals in CAFOs. And antibiotics are typically NOT used to cure disease on CAFOs. Rather, they’re used to promote growth or to prevent diseases that so often result from animals kept in unsanitary conditions. What’s worse, last resort antibiotics for humans are commonly used in CAFOs. So it’s no wonder that resistant bacteria are rampant in industrial meat products. Attempts have been made to regulate antibiotic use in CAFOs better. In January of 2012, the FDA prohibited the use of cephalosporins in food animals. This didn’t make much difference, though. That class of drugs makes up less than 1% of the antibiotics used in the U.S. on food animals every year. A 2016 study published by researchers at Ohio State University warned of the very real potential of a post-antibiotic age after finding bacteria that was resistant to last line antibiotics on a Midwestern hog farm. The FDA eventually took action in 2017. The rules state that farmers can no longer give antibiotics to animals for the purposes of weight gain. They also can’t buy antibiotics without the oversight of a veterinarian. Will this help? Probably. But not as much as you might hope. Even after the 2017 attempt to crack down on CAFO antibiotic use, testing conducted at meat packing plants shows that not much has changed. Testing on thousands of meat samples by the US Food Safety and Inspection Service (FSIS) found that antibiotics categorized as critical for human health are still in use on farm animals. One reason for this is that, according to the Bureau of Investigative Journalism, growers can easily exploit an abundance of regulatory loopholes. Just as we’ve industrialized agriculture for land animals, we’ve done the same to aquatic animals. And although fish don’t typically come to mind when we envision factory farms, that doesn’t mean that farmed fish are living in better conditions. Antibiotic use runs deep in the aquatic environment, too — and so does antibiotic resistance. Fish farms often pack fish tightly together in huge, unsanitary pools. Just like factory farming of land animals, the fish receive antibiotics (and other drugs, like pesticides) to prevent the spread of disease. A 2015 study published in the Journal of Hazardous Materials sheds light on this hidden problem. Researchers looked at 27 fish from 11 countries. The researchers found residues of five antibiotics — including tetracycline and other drugs used to treat human infections. Remarkably enough, they even found residues in farmed fish with an antibiotic-free label. It turns out that farmed fish don’t have to get antibiotics directly to carry them. That’s because many are eating antibiotic-contaminated fishmeal. Levels of antibiotic-resistant bacteria in seafood have exploded in the past 30 years. The hope, of course, is that one day, governments will take stronger action against antibiotic use on factory farms. Some countries have done so already, including Denmark, Sweden, Germany, and the Netherlands. And they are seeing significant reductions in antibiotic overuse. Whether or not government policy grows more enlightened, we can all take positive actions now to help preserve the efficacy of antibiotics and to support better industrial food practices. The most significant contribution we can each make is to transition to a plant-powered diet. If enough of us do so, we’ll drastically reduce consumer support for industrialized animal agriculture — the inhumane industry that brings factory-farmed meat, dairy, eggs, and fish products to plates everywhere. If you do choose to eat animal products, opting for wild, pasture-raised, and antibiotic-free can help ensure you aren’t unintentionally contributing to this enormous problem. Antibiotics are a miracle of medicine. But now, thanks to factory farming, antibiotic overuse has become a driver of what could become one of the most terrifying public health emergencies in history. Unless we take action to preserve the viability of antibiotics for future generations, we will lose millions of lives. The problem of antibiotic-resistant bacteria isn’t one that any of us can solve all by ourselves.Slowing its spread is going to take collective action from governments, farmers, and concerned citizens around the world. It’s also going to take reducing the frequency with which doctors prescribe antibiotics to humans. But just because you and I can’t solve it all by ourselves doesn’t mean we should refuse to do what we can. As a concerned citizen who wants a safe future for humanity, the #1 step you can take is to boycott antibiotic-contaminated meat. You can also go a step further and urge restaurants and supermarkets to do the same. We should ensure a future in which, if a crisis arises, every baby’s life can be saved by these miracle drugs the way mine was when I was three months old.